This is craft makes a great gift from a child to a loved one. It’s also a great way to recycle baby food jars. It’s a fun craft and makes a great decoration in any home. Follow the step-by-step directions below to make your very own baby food jar candle. 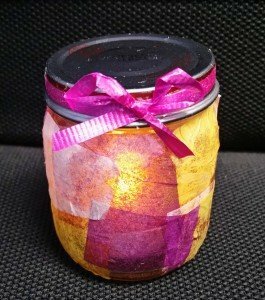 Step 2: Place the battery operated tealight candle inside the jar. Step 3: Glue ribbon around the rim of the baby food jar lid. Optional: If you are making this as a gift, try wrapping it in tissue paper and or cellophane and secure with a bow.